Austria Hungary did not have much freedom to chose a policy in 1700. From the west Austria-Hungary had been under attack by France for decades. From the south east the still mighty Ottoman Empire was just as aggressive. Meanwhile states like Prussia, Hanover, Bavaria and Savoy were upcoming threats to the Habsburg control of the Empire. All this left the emperor few choices. The immediate task of surviving the continuing French and Ottoman onslaught was challenging enough to ban any thought of initiating its own aggressive policy. In the Great Turkish War the emperor had conquered almost all of Hungary. This meant a fundamental change in Austria's position. Hungary was just as big or even bigger than the territories the Habsburgs ruled before. The Ottoman state had not become that much weaker, but it was no longer at the gates of Vienna. Austria-Hungary was a much stronger and less fragile state than Austria. Time became an advantage for Austria-Hungary. With Hungary getting re-populated and its economy getting restored, Austria-Hungary became stronger each year. One of the big problems of Austria Hungary was the backwardsness of its economy. While the nations of western and northern Europe were involved in oceanic trade, Austria was not. It was not even involved in trade in the Mediterranean. As a consequence money spent on tobacco, coffee, tea and other luxuries flowed out of the country, while there were few exports that could bring the money back. With regard to the Spanish Succession the emperor would not be in a position to take it by arms. He did however have a very strong advantage in being able to get the help of the Seapowers. These were determined not to let France have too much of it. They were also not willing to hand the whole inheritance to the emperor, because that would lead to a reconstitution of the Empire of Charles V. The expedient was that the emperor waved his right so that his second son Archduke Charles would inherit the whole Spanish monarchy. Later on Archduke Charles became emperor and reopened the perspective of a reconstitution of the Empire of Charles V. It was a more or less genuine excuse for the English to cease their support for Austria Hungary. In Hungary the imperial policy with regard to the local population had not been very sensible. Especially the prosecution of the Protestants had made the country rife for rebellion. 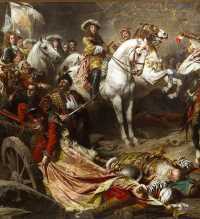 The subsequent revolt by Ferenc Rákóczi would lead to a revolt that almost undid all the advantages gained in the Great Turkish War, and could have led to the loss of the War of the Spanish Succession. In order to enlist the aid of Prussia and Hanover, the emperor was forced to make serious concessions to these states. Hanover had been made an electorate in 1695. With regard to Prussia, Frederick III had been recognized as King in Prussia in 1701. The new king also expected (and got) recognition for his ambitions on the Lower Rhine. Some of the Imperial circles made significant contributions to the war effort by fielding units for the imperial army. In the end the emperor saw this as a threat to his authority, and did not act upon this development, that might have offered a chance to reform the empire. Italy was very important for the emperor. With Milan he could control the French approaches to the south of Austria, and could hope to subject the minor Italian states. Of course he hoped that with Northern Italy under control, Naples and Sicily could swing to his side or be conquered. The way to Spain would then be open. In contrast to this a campaign in the Spanish Netherlands offered few advantages. This kind of explains why Austria-Hungary started the war with a campaign in Italy in 1701.